Roman Lee Hruska /ˈrʌskə/ (August 16, 1904 – April 25, 1999) was a Republican U.S. Senator from the state of Nebraska. 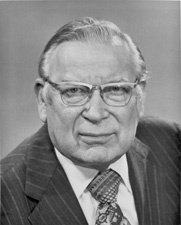 Hruska was known as one of the most vocal conservatives in the United States Senate during the 1960s and 1970s. Hruska was also co-founder of the Douglas Theatre Company, based in Nebraska. Hruska was born in David City, Nebraska. His family moved to Omaha, where he graduated from high school. He attended the University of Omaha and the University of Chicago and graduated from the Creighton University School of Law. He settled in Omaha, Nebraska and became a lawyer. Hruska soon entered politics, becoming a member of the Douglas County, Nebraska board of commissioners. He served as a regular member from 1944 to 1945 and as chairman from 1945 to 1952. He was vice-president of the National Association of County Officials from 1951 to 1952, and served for a time as a member of the Nebraska Board of control and the board of regents of the University of Omaha. Hruska was elected to the United States House of Representatives from the Omaha-dominated second district of Nebraska. He served only one term, as he ran for a United States Senate seat in 1954, which was vacated by the death of Hugh Butler. Hruska won, and was reelected in 1958, 1964 and 1970 and served in the Senate until his retirement in 1976. His opponent in 1958 and 1970 was Frank B. Morrison. Hruska did not run for reelection to a fourth full term. Even after Nixon resigned, Hruska defended him and claimed Watergate only became a scandal as part of a partisan effort to attack Nixon. Hruska became an influential member of the Senate Appropriations Committee and the Senate Judiciary Committee. He voted for the Civil Rights Act of 1964. Though Congress was controlled by Democrats for his entire time in the Senate, he was known as a skillful legislator, and was said to have influenced much of the federal criminal justice system's changes during his era. He was the ranking minority member of the Judiciary Committee at the time of his retirement. On October 10, 1978, President Carter signed into law a bill which renamed the U.S. Meat Animal Research Center (USMARC) located in Clay County, Nebraska after former Senator Roman L. Hruska. The Roman L. Hruska Federal Courthouse in Omaha is also named in his honor. This speech was criticized by many, and Carswell was eventually defeated. Hruska moved back to Omaha in 1976, and lived there until his death. On April 10, 1999, he fell, broke his hip, and died fifteen days later from complications during treatment. He was buried in Bohemian Cemetery in Omaha. Hruska was married to Victoria Kuncl Hruska. They had three children: Jana, Quentin and Roman, Jr.
^ "Hruska dead at 94". Columbus Telegram. April 26, 1999. Retrieved April 22, 2018. ^ William H. Hohan (April 27, 1999). "Roman L. Hruska Dies at 94; Leading Senate Conservative". The New York Times Company. Retrieved April 22, 2018. ^ Roderick MacLeisch, The Washington Post, Book on Carswell 'Brawl' Said Superb, published in Sarasota Herald-Tribune, April 18, 1971. ^ Meriden (Connecticut) Morning Record, Mediocrity Not Necessary, April 4, 1970. ^ Art Buchwald, Support Your Mediocre Judge, The Vindicator, March 26, 1970.